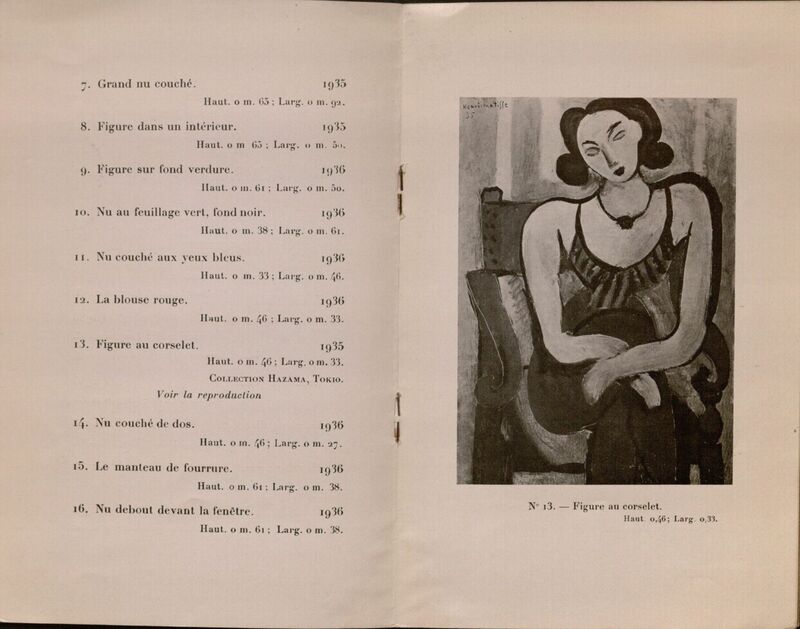 The Fine Arts library recently purchased two rare exhibition catalogues from Paul Rosenberg’s gallery in Paris. 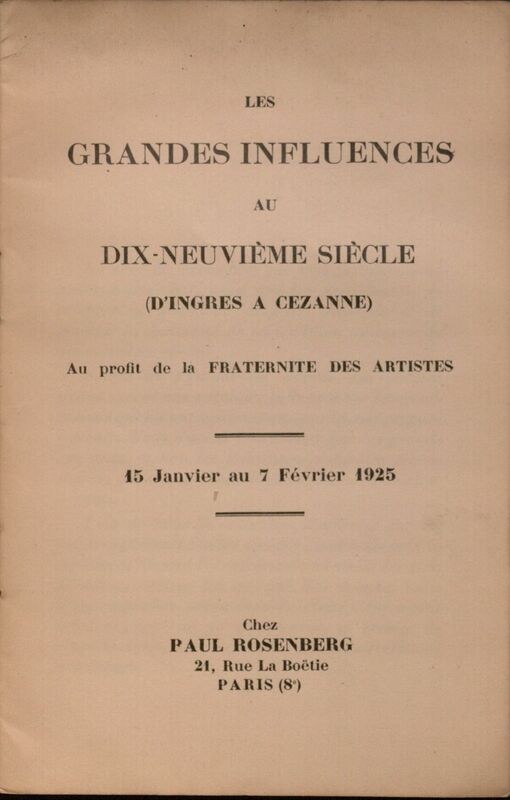 Les grandes influences au dix-neuvieme siècle, published in 1925, is one of the earliest of Rosenberg’s documented shows. Exposition d’oeuvres recentes de Henri-Matisse, is from 1936. Rosenberg was Matisse’s dealer and an early champion; this illustrated catalogue is a valuable addition our holdings of the bibliography on this artist. 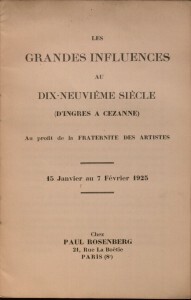 Paul Rosenberg (1881-1959) opened his gallery on the Rue La Boetie in 1911. He moved to New York in 1940, and Paul Rosenberg & Co. continued to operate after his death. Rosenberg’s papers are in the archives of the Museum of Modern Art in New York. The Fine Arts Library now owns over three dozen of the galleries’ publications. Here are photographs of the unassuming and enigmatic interior of a recently acquired 1977 James Lee Byars catalogue, issued to accompany an exhibition at the Städtisches Museum Mönchengladbach in Germany. A gold box contains a sheet of crumpled black tissue paper with “TH FI TO IN PH” printed in gold, short for ’THe FIrst TOtally INterrogativ PHilosophy’. Johannes Cladders’ essay is printed inside the box. Byars’ object is merely the latest addition to our collection of over a dozen Mönchengladbach catalogs edited or assembled by Cladders in the 1970s and issued in challenging formats such as boxes, scrolls, and portable cases and featuring the work of iconic conceptual artists like Marcel Broodthaers, Giulio Paolini, Daniel Buren, and Jannis Kounellis. The Fine Arts Library recently purchased a copy of one of the earliest Jean Tinguely exhibition catalogues, his show at the Museum Haus Lange in Krefeld, Germany, September – October, 1960. This small show came hard upon Tinguely’s earliest (and perhaps greatest) success, the debut of his “metamatic” or self-destructing machine Hommage to New York at the Museum of Modern Art that spring. 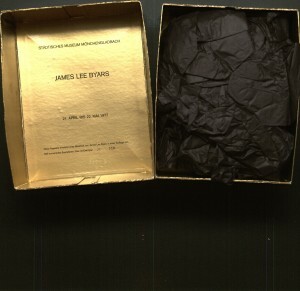 The catalogue which accompanied the show in Krefeld consists of a black paper folder with the dates, credits, and colophon (our copy is numbered 230 in yellow crayon), with a quarto folded sheet of photographs of the artist at work and works in situ and two ‘metamatic’ paintings, each signed by Tinguely in ink.